The manor of Chenesitone is listed in the Domesday Book of 1086, which in the Anglo-Saxon language means "Chenesi's ton" (homestead/settlement). One early spelling is Kesyngton, as written in 1396. The manor of Kensington in the county of Middlesex, was one of several hundred granted by King William the Conqueror (1066-1089) to Geoffrey de Montbray (or Mowbray), Bishop of Coutances in Normandy, one of his inner circle of advisors and one of the wealthiest men in post-Conquest England. He granted the tenancy of Kensington to his follower Aubrey de Vere I, who was holding the manor from him as overlord in 1086, according to the Domesday Book. The bishop's heir, Robert de Mowbray, rebelled against King William II and his vast feudal barony was forfeited to the Crown. Aubrey de Vere I thus became a tenant-in-chief, holding directly from the king after 1095, which increased his status in feudal England. He granted the church and an estate within the manor to Abingdon Abbey in Oxfordshire, at the deathbed request of his eldest son Geoffrey. As the de Veres became Earls of Oxford, their principal manor at Kensington came to be known as Earl's Court, as they were not resident in the manor, and their manorial business was not conducted in the great hall of a manor house but in a court house. In order to differentiate it, the new sub-manor granted to Abingdon Abbey became known as Abbot's Kensington and the church St Mary Abbots. A map showing the wards of Kensington Metropolitan Borough as they appeared in 1916. The focus of the area is Kensington High Street, a busy commercial centre with many shops, typically upmarket. The street was declared London's second best shopping street in February 2005 due to its wide range and number of shops. However, since October 2008 the street has faced competition from the Westfield shopping centre in nearby White City. Kensington's second group of commercial buildings is at South Kensington, where several streets of small to medium-sized shops and service businesses are situated close to South Kensington tube station. This is also the southern end of Exhibition Road, the thoroughfare which serves the area's museums and educational institutions. 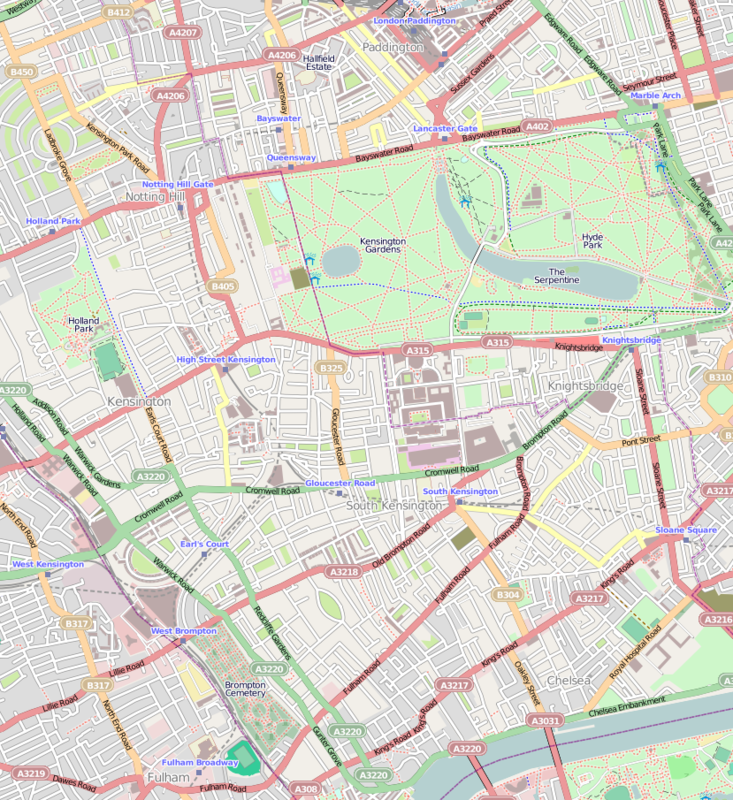 The boundaries of Kensington are not well-defined; in particular, the southern part of Kensington has conflicting and complex borders with Chelsea (another ancient manor) whether electoral or postal definitions are used, and has similar architecture. To the west, a border is clearly defined by the line of the Counter Creek marked by the West London railway line. To the north, the only obvious border line is Holland Park Avenue, to the north of which is the district of Notting Hill (another ancient manor), usually classed as within "North Kensington". In the north east is situated the large public Royal Park of Kensington Gardens (contiguous with its eastern neighbour, Hyde Park). The other main green area in Kensington is Holland Park, on the north side of the eastern end of Kensington High Street. Many residential roads have small communal garden squares, for the exclusive use of the residents. South Kensington also largely comprises private housing. North Kensington and West Kensington are largely devoid of features to attract the visitor. Kensington is, in general, an extremely affluent area, a trait that it shares with Chelsea, its neighbour to the south. The area has some of London's most expensive streets and garden squares, and at about the turn of the 21st century the Holland Park neighbourhood became particularly high-status. In early 2007 houses sold in Upper Phillimore Gardens, immediately east of Holland Park, for over £20 million. Brompton is another definable area of Kensington. The Royal Borough of Kensington and Chelsea forms part of the most densely populated local government district in the United Kingdom. This high density has come about through the subdivision of large mid-rise Georgian and Victorian terraced houses (generally of four to six floors) into flats. The less-affluent northern extremity of Kensington has high-rise residential buildings, while this type of building in the southern part is only represented by the Holiday Inn's London Kensington Forum Hotel in Cromwell Road, a 27-storey building. Notable attractions and institutions in Kensington include: Kensington Palace in Kensington Gardens; the Royal Albert Hall opposite the Albert Memorial in Hyde Park; the Royal College of Music; the Natural History Museum; the Science Museum; the Victoria and Albert Museum; Heythrop College; Imperial College; the Royal College of Art and Kensington and Chelsea College. The Olympia Exhibition Hall is just over the western border in West Kensington. Kensington is administered within the Royal Borough of Kensington and Chelsea, and lies within the Kensington parliamentary constituency. The head office of newspaper group DMGT is located in Northcliffe House off Kensington High Street in part of the large Barkers department store building. In addition to housing the offices for the DMGT newspapers Daily Mail, Mail on Sunday and Metro, Northcliffe House also accommodates the offices of the newspapers owned by Evgeny Lebedev: The Independent, The Independent on Sunday, and the Evening Standard. The i newspaper, sold to Johnston Press in 2016, is still produced from offices in Northcliffe House. Most of these titles were for many decades produced and printed in Fleet Street in the City of London. The building also houses Lebedev's TV channel London Live, with its news studio situated in part of the former department store, using St Mary Abbots church and Kensington Church Street as live backdrop. Kensington is crossed east-west by three main roads, the most important of which is the A4 Cromwell Road which connects it to Central London on the east and to Hounslow and Heathrow Airport on the west. Parallel to the north is Kensington Road (of which Kensington High Street forms the eastern part), linking central London and Hammersmith and Hounslow to the area. To the south is Fulham Road, which connects South Kensington with Fulham to the south-west. North-south connections are not as well-developed and there is no obvious single north-south route through the area. Kensington is well served by public transport. Most of Kensington is served by three stations in the Travelcard Zone 1: High Street Kensington, Gloucester Road and South Kensington. All three are served by the Circle line which connects them to London's railway terminals. The District line also serves all three stations, albeit on different branches; it links the latter two to Westminster and the City. The Piccadilly line also links South Kensington and Gloucester Road to the West End in about 10 minutes, and in the other direction to Chiswick, Ealing, Hounslow and Heathrow Airport in around 20-40 minutes, depending on the area of choice. In addition Kensington (Olympia) in Travelcard Zone 2 serves the western part of Kensington, with District line trains to Earl's Court and High Street Kensington. Nearby West Kensington station takes its name from the former boundaries with Hammersmith and is not in the Borough. A number of local bus services link Kensington into the surrounding districts, and key hubs are Kensington High Street and South Kensington station. These bus services were improved in frequency and spread from 2007 until 2010 when the western extension of the London congestion charge area existed (which required drivers of cars and vans during the charging hours Monday-Friday to pay a daily fee of £8). 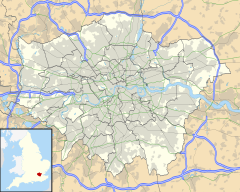 Kensington has one football team, Kensington Borough F.C., which currently plays in the Combined Counties Football League. Antonia Bird (1951–2013), film director. ^ "Contacts Archived 9 August 2011 at the Wayback Machine." Daily Mail and General Trust. Retrieved 6 September 2011. "Northcliffe House 2 Derry Street London W8 5TT Great Britain"
^ Ponsford, Dominic. "Sharing with Mail 'will safeguard future of Independent'[permanent dead link]." Press Gazette. 28 November 2008. Retrieved 6 September 2011. "Under a deal signed today, the Independent titles will share back office functions with the Daily Mail, Mail on Sunday, Metro and Evening Standard at Northcliffe House in Kensington." Look up Kensington in Wiktionary, the free dictionary.